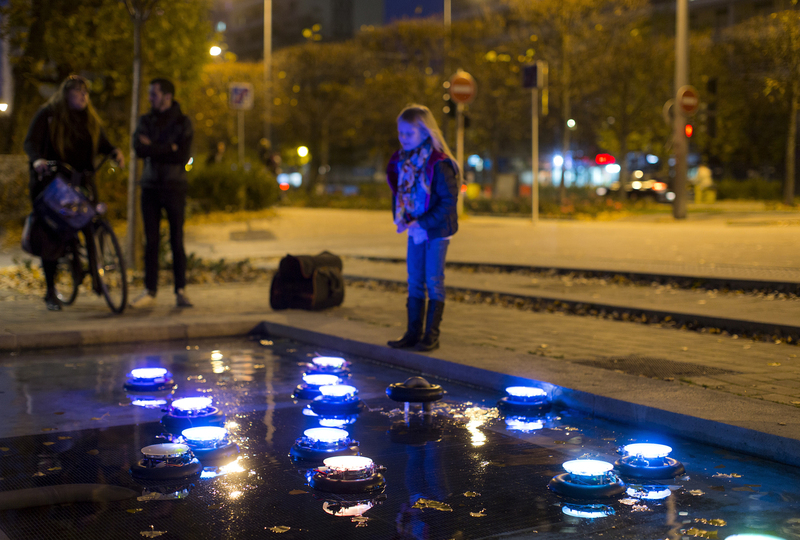 Vessels is a robotic installation consisting of large groups of autonomous water vehicles. The robotic agents interact with each other and their environment to form a simple ecosystem. Their collective, emergent behaviour resembles the social interactions in a community of living creatures. Observers may empathize with the robots’ behaviours, ascribe intentions and motivations to their actions, and/or draw correlations between the group dynamic and unseen characteristics of their milieu. 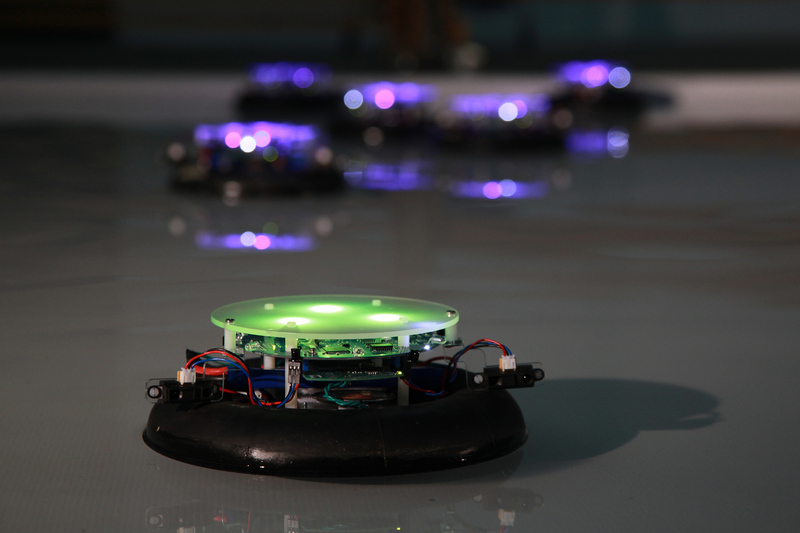 While moving on water, each of the robots collect and interpret data from different environmental conditions such as water and air quality, temperature, ambient light, sound, etc. Since no single agent has more than one or two sensors, they depend on communicating with each other to form a complete awareness of their environment. However, the robots do not simply exchange scientific readings: instead they communicate through behaviours and interactions. For example, an increase in temperature sensed by one agent may cause it to act more aggressively, with erratic or irrational (random) movements. This change in behaviour will influence its neighbouring agents, who may respond with relative changes to their own behaviour. These agents will in turn influence their neighbours, thus creating a ripple effect of actions. Over time, a collective behaviour that is specific to the immediate environmental characteristics of the presentation site emerges from the agents’ interactions. The work thus acts as an organic laboratory that responds to hidden features of the urban ecosystem by displaying emergent social behaviours, offering the viewers a new perspective on their living milieu and a model for cultural exploration. The number of robots presented range from 10 to 50 depending on availability and context. L'Ososphère à l'Université de Strasbourg, UTV, Nov. 19th, 2015. TV report on L'Ososphère event, including interview about Vessels (starting at 4:30). In French. Debatty, Régine. 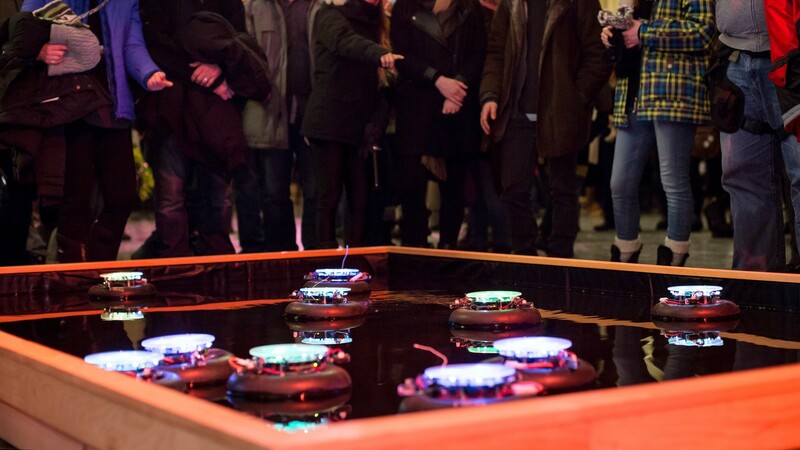 Vessels, a fleet of robots with unpredictable behaviour. We Make Money Not Art, Sep. 2nd, 2013. González, Semíramis. Vessels, a Research Residency at LABoral. Aug. 12, 2013. Original spanish version available here. Baichtal, John. 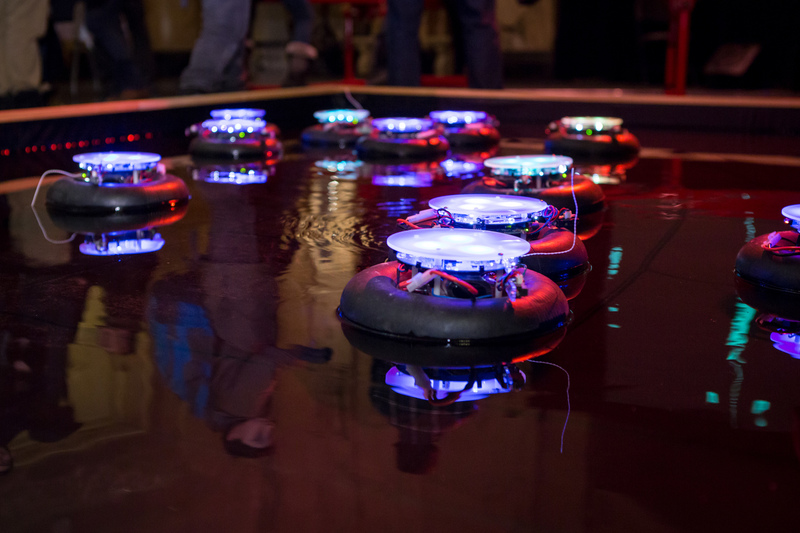 Waterborne Robots Display Emergent Behavior, Makezine.com, Oct. 1., 2013. Merayo, P. Laboral recluta para el centro de arte a profesionales de diferentes ámbitos, Elcomercio.es, Aug. 31, 2013. Suarez, Miriam. El Centro de Arte recibe el apoyo de cien notables asturianos para captar fondos, La Neuva Espana, Aug. 31, 2013. LABoral celebrará jornadas de Puertas Abiertas durante los meses de julio y agosto, todo-arte.es, Jun. 25, 2013. Bosco, Roberta and Caldana, Stefano. ¿Plagio, apropiacionismo o desconocimiento? El Pais, Sep. 23, 2013.